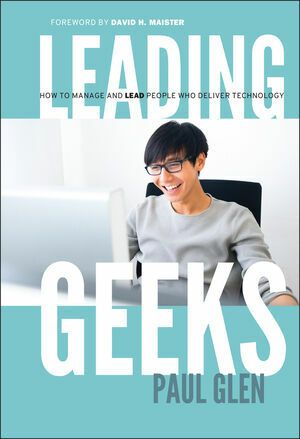 Leading Geeks challenges the conventional wisdom that leadership methods are universal and gives executives and managers the understanding they need to manage and lead the technologists on whom they have become so dependent. This much-needed book? written in nontechnical language by Paul Glen, a highly acclaimed management consultant? gives clear directions on how to effectively lead these brilliant yet notoriously resistant-to-being-managed knowledge workers. Glen not only provides proven management strategies but also background on why traditional approaches often don't work with geeks. Leading Geeks describes the beliefs and behavior of geeks, their group dynamics, and the unique nature of technical work. It also offers a unique twelve-part model that explains how knowledge workers deliver value to an organization. Paul Glen is a management consultant who helps clients build effective technology organizations. For more than fifteen years he has advised clients in the United States, Europe, and Asia. He has also served as an adjunct faculty member in the MBA programs at the University of Southern California's Marshall School of Business and Loyola Marymount University. Prior to founding C2 Consulting, he was western regional manager for SEI Information Technology, a national IT consultancy. And, yes, he is a geek. Overview: The Challenge of Geeks. 1. Geeks, Leadership, and Geek Leadership. Part One: The Context of Geek Leadership. 4. The Nature of Geekwork. Part Two: The Content of Geek Leadership. 10. Selecting and Organizing Geekwork. 11. Uniting Geeks and Geekwork. Conclusion: Harmonizing Context and Content. 12. How Geek Leaders Lead. "Winner of the 2003 Financial Times Germany and getAbstract Award for best book on business leadership"